It's one you probably have sitting in your refrigerator right now. And you probably use it most days. I don't use it at all for what it was intended for...because I don't drink coffee. When a recipe calls for milk, I add in the creamers instead. It gives it a nice little flavor twist. The great part is, these go on sale enough that I can keep a stockpile for just pennies. 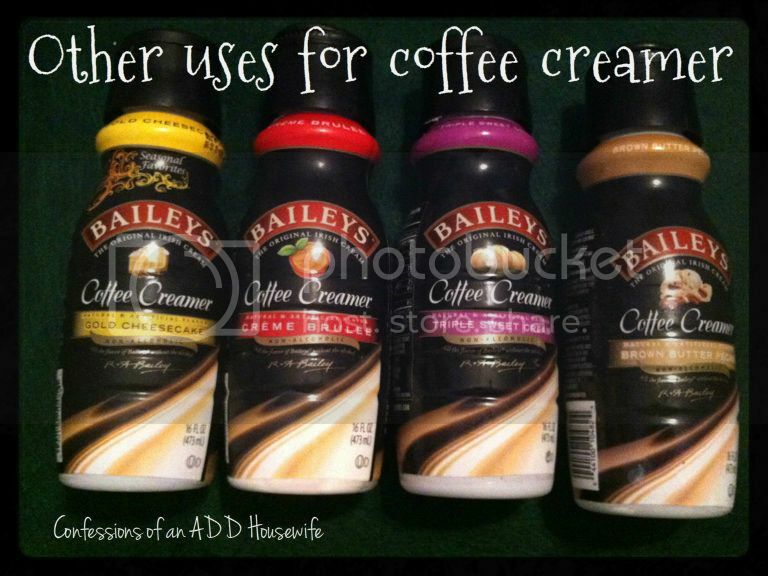 I picked up the Bailey's Creamers two weeks ago for 15 cents EACH! It's absolutely dreamy in hot chocolate. It's like being able to get all those fancy schmancy hot chocolate flavors without having to buy the expensive hot chocolates or the expensive syrups. Powdered Sugar Icing. Yeah...just a bit of extra flavor right into that powdered sugar, butter and milk coffee creamer icing. Oatmeal. I love to have a bit of milk in my oatmeal. And let's face it, plain stove top cooked oatmeal is quite a bit cheaper than the instant stuff. French Toast. This has to be my personal favorite. Just replace the milk in the french toast with the creamer. The extra flavoring isn't overpowering, really just a hint of sweet. I don't often have creamer in my fridge since the all natural stuff doesn't go on sale very often, but usually when I do, it goes on oatmeal. Never tried it in french toast -- definitely worth a try!! Egg nog is my preferred coffee/cereal/baking flavor of choice this time of year! Wow, I never dreamed to use coffee creamer in all these amazing ways. Oatmeal will never be the same again! Brilliant! Never thought of this one, but I'm glad you did! A lady I work with was telling me about making french toast with coffee creamer. I want to try it with the Pumpkin Spice flavor. Thanks so much for sharing this on Marvelous Mondays!